For others of the same name, see John Harrington. Harrington was born and grew up in Reedsburg, Wisconsin and attended high school there. After graduating, he went to Marquette University in Milwaukee, Wisconsin, and played his first football game for the college team in 1941, when he was a sophomore. Harrington, who played as an end, had two touchdown catches in one of his first games against Kansas. In 1942, he was named the Marquette football team's captain. Harrington then entered the Second Air Force during World War II and was the captain of the unit's Superbombers football team, who played in the Treasury Bond Bowl in 1944. In 1945, Harrington played with the Fourth Air Force's football team, the Flyers. Harrington was drafted in the eighth round of the 1945 NFL Draft by the Chicago Cardinals, but did not play for the team. In March 1946, the Cleveland Browns of the new All-America Football Conference (AAFC) announced that they had signed Harrington. He reported to the team's training camp several days late to finish summer school studies at Marquette, to which he had returned after his discharge from the Army. Competition in training camp was intense, and Harrington was thought to have little chance of making the Browns' roster. His number was not listed in the program for the Browns' first game against the Miami Seahawks, but Harrington put in a solid defensive performance in the 44–0 victory, tackling Miami's backs for losses several times. The Browns won the AAFC championship that year. 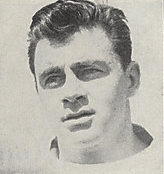 Before the 1947 season began, the Browns traded Harrington and Jim Daniell to the AAFC's Chicago Rockets for halfback Bill Boedeker. 1 2 Sixty, Billy (October 13, 1942). "John Harrington Named Hilltop Captain Saturday". The Milwaukee Journal. p. 6. Retrieved August 2, 2012. ↑ Thisted, Red (October 5, 1941). "Record Crowd Sees Gold Take Play Away From Badgers". The Milwaukee Sentinel. p. B3. Retrieved August 2, 2012. ↑ Thisted, Red (October 19, 1941). "Hilltops Win; Harder Leads Badgers to 23-0 Victory". The Milwaukee Sentinel. p. 15A. Retrieved August 2, 2012. ↑ Danzig, Allison (December 14, 1944). "Bond Bowl Rivals Impress In Drills". The New York Times. Archived from the original on October 6, 2012. Retrieved August 2, 2012. 1 2 "Harrington Is Arrival in Brown Camp". Cleveland Plain Dealer. August 3, 1946. p. 14. John Harrington, former Marquette University end who played with the Second Air Force Superbombers in 1944 and with the Fourth Air Force Flyers last season, joined the Cleveland Browns today. Harrington had been granted permission by Coach Paul Brown to report a few days late so that he could finish the summer school term at Marquette, where he returned to study following his discharge from the army. An accomplished pass receiver and a better than ordinary defensive performer, Harrington had a reunion here with three of his old Marquette teammates, Mel Maceau, George Groves and Wilfred Kramer. ↑ "Ex-Marquette Guard Signed by Browns". Cleveland Plain Dealer. March 3, 1946. p. 2C. ↑ Sauerbrei, Harold (October 5, 1946). "Harrington, Coppage -- Browns' End Men -- Out to Spoil Dobbs' Act". Cleveland Plain Dealer. p. 13. Harrington is the end who came to the Browns' training camp a virtual unknown and so little was thought of his chances of sticking with the team that his number wasn't listed in the program the night the season opened against Miami at the stadium. But John gave a sparkling performance on defense that night, tossing Miami backs for huge losses several times, and has been going good ever since. ↑ Piascik 2007, p. 71.